4. Who can benefit from this? Four core pillars: Mnemonic, Discoverable, Consistent and "Crowd-Configured". If any of these core pillars is violated open an issue and we'll try our best to fix it. Innovative real-time display of available key bindings. Simple query system to quickly find available layers, packages, and more. Similar functionalities have the same key binding everywhere thanks to a clearly defined set of conventions. Documentation is mandatory for any layer that ships with Spacemacs. Bring the efficiency of modal editing to the powerful Emacs lisp platform. Modal UX is optional and Spacemacs can be used with only Emacs key bindings. Integrate nicely with Evil states (Vim modes). Keep your fingers on the home row for quicker editing with support for QWERTY and BEPO layouts. Minimalistic and nice graphical UI keeps your available screen space for what matters: your text files. Fast boot time: packages and configuration are lazy-loaded as much as possible. Lower the risk of RSI by heavily using the space bar instead of modifiers. If you have issues with your thumbs you can still use Spacemacs using modifiers. Contribute easily your improvements and new configuration layers. Note: Even though screenshots are updated frequently, Spacemacs is evolving quickly and the screenshots may not reflect exactly the current state of the project. 4 Who can benefit from this? Spacemacs was initially intended to be used by Vim users who want to go to the next level by using Emacs (see guide for Vimmers). But it is now perfectly usable by non Vim users by choosing the emacs editing style. It is also a good fit for people wanting to lower the risk of RSI induced by the default Emacs key bindings. (This is an assumption, there are no official studies to prove this!) If you have issues using your thumbs you can still use the emacs editing style which puts the leader key on a modifier combination. Emacs users wanting to learn a different way to edit files or wanting to learn Vim key bindings or even wanting to mix both editing styles by setting their style to hybrid. Emacs users wanting a simple but deep configuration system that greatly lower the risk of .emacs bankruptcy. Pair-programming users thanks to out of the box support for dynamic switching of editing style. A Vim user and an Emacs user can use the same Spacemacs comfortably. There are several methods of updating the core files and layer information for Spacemacs. It is recommended to update the packages first; see the next section. Note: If you use the develop branch of Spacemacs, automatic update is disabled—you have to update manually using git. Use the button labeled "Update Spacemacs" in the Spacemacs buffer. You will be prompted for the version you would like to use. Note: If you use the develop branch of Spacemacs, you cannot use this method. Note: The master branch is considered to be immutable in the sense that you must not modify it by adding your own commit. If you do so you will break the automatic update of Spacemacs on the master branch. To fork Spacemacs code you have to use a custom branch that you manage manually. To update the Emacs packages used by Spacemacs press RET (enter) or click on the link [Update Packages] in the startup page under the banner then restart Emacs. If you prefer, you can use the command configuration-layer/update-packages instead of the button. If anything goes wrong you should be able to rollback the update by pressing RET or clicking on the [Rollback Package Update] link in the startup page and choosing a rollback slot (sorted by date). This button uses the command configuration-layer/rollback. This section is an overview of layers. A more extensive introduction to writing configuration layers can be found here (recommended reading!). Layers help collect related packages together to provide features. For example, the python layer provides auto-completion, syntax checking, and REPL support for python files. This approach helps keep configuration organized and reduces overhead for the user by keeping them from having to think about what packages to install. To install all the python features the user has just to add the python layer to their dotfile. installed from an online source using quelpa. Packages are declared in a variable called <layer>-packages where <layer> is the name of the layer. For details on installing packages using quelpa or local packages see LAYERS. It is common to define the body with the use-package macro. It is possible to exclude some packages from Spacemacs on a per-layer basis. This is useful when a configuration layer aims to replace a stock package declared in the Spacemacs layer. To do so add the package names to exclude to the variable <layer>-excluded-packages. Sometimes a layer can be an unnecessary overhead, this is the case if you just want to install a package with very few configuration associated to it. A good example is some niche language where you are only interested in syntax highlighting. You can install such packages by adding them to the variable dotspacemacs-additional-packages under the dotspacemacs/layers function in your dotfile. If you want to add some configuration for them then put the configuration in the dotspacemacs/user-config function or consider creating a layer. Spacemacs will only install the packages that are explicitly used by the user. A package is considered to be used if its layer is used (i.e. listed in dotspacemacs-configuration-layers). Any packages that are not used is considered to be orphan and is deleted at the next startup of Emacs. If you decide to provide a configuration layer, please check the contribution guidelines first in CONTRIBUTING. This is a simple configuration layer listing a bunch of themes which you can find here. Adding this layer will install around 100 themes; to uninstall them remove the layer from the dotspacemacs-configuration-layers and press SPC f e R.
Spacemacs's configuration system is flexible enough to let you manage your private layers in different ways. Everything in the private directory is ignored by Git so it is a good place to store private layers. There is a huge drawback to this approach though: your layers are not source controlled. This is the recommended way to manage your private layers. The best approach is to store all your private layers into an external Git repository. It is especially a good practice to store them in your dotfiles repository if you have one. Put also your ~/.spacemacs file in it. Then you are free to symlink your layers into ~/emacs.d/private or let them anywhere you want and reference the parent directory in the variable dotspacemacs-configuration-layer-path of your ~/.spacemacs. Note that you could also have a dedicated repository for all your private layers and then directly clone this repository in ~/.emacs.d/private. The final main way to manage your private layers is to push them in a personal branch that you keep up to date with upstream master or develop. Please refer to this introduction for some tips on writing layers, and how to best make them fit with the Spacemacs philosophy and loading strategy. User configuration can be stored in your ~/.spacemacs file. The very first time Spacemacs starts up, it will ask you several questions and then install the .spacemacs in your HOME directory. A dotdirectory ~/.spacemacs.d/ can be used instead of a dotfile. If you want to use this option, move ~/.spacemacs to ~/.spacemacs.d/init.el. It is also possible to override the location of ~/.spacemacs.d/ using the environment variable SPACEMACSDIR. Of course you can also use symlinks to change the location of this directory. Note: ~/.spacemacs will always take priority over ~/.spacemacs.d/init.el, so ~/.spacemacs must not exist for ~/.spacemacs.d/init.el to be used by Spacemacs. To apply the modifications made in ~/.spacemacs press SPC f e R. It will re-execute the Spacemacs initialization process. Note: A synchronization re-executes the functions dotspacemacs/init, dotspacemacs/user-init and dotspacemacs/user-config. Depending on the content of this functions you may encounter some unwanted side effects. For instance if you use a toggle in dotspacemac/user-config to enable some behavior, this behavior will be turned off whenever the dotfile is re-synchronized. To avoid these side-effects it is recommended to either use setq expressions instead of toggle functions, or to use the on or off versions instead (i.e. instead of spacemacs/toggle-<thing>, use spacemacs/toggle-<thing>-on or spacemacs/toggle-<thing>-off). It is possible to skip the execution of dotspacemacs/user-config with the universal argument (SPC u SPC f e R). You can use the command SPC SPC dotspacemacs/test-dotfile to check if your ~/.spacemacs looks correct. This will check, among other things, whether the declared layers can be found and that the variables have sensible values. These tests are also run automatically when you synchronize with SPC f e R.
dotspacemacs/layers is called at the very startup of Spacemacs initilialization, this is where you set the Spacemacs distribution and declare layers to be used in your configuration. You can also add or excluded packages of your choice and tweak some behavior of Spacemacs loading. dotspacemacs/init is called at the very startup of Spacemacs initialization before layers configuration. You should not put any user code in there besides modifying the Spacemacs variable values prefixed with dotspacemacs-. dotspacemacs/user-init is called immediately after dotspacemacs/init, before layer configuration. This function is mostly useful for variables that need to be set before packages are loaded. dotspacemacs/user-config is called at the very end of Spacemacs initialization after layers configuration. This is the place where most of your configurations should be done. Unless it is explicitly specified that a variable should be set before a package is loaded, you should place your code here. Custom variables configuration from M-x customize-group built-in Emacs feature are automatically saved by Emacs at the end of your ~/.spacemacs file. To use a configuration layer, declare it in your dotfile by adding it to the dotspacemacs-configuration-layers variable of your ~/.spacemacs. Note: In this documentation a used layer is equivalent to a declared layer. ;; List of configuration layers to load. The :variables keyword is a convenience to keep layer configuration close to their declaration. Setting layer variables in the dotspacemacs/user-init function of your dotfile is also a perfectly valid way to configure a layer. Often layers enable services that other layers can use. For instance if you use the layer auto-completion then every other layers supporting auto-completion will have this feature enabled. Sometimes you may want to disable a service added by a layer in some specific layers. Say you want to disable auto-completion in org and git layers, you can do it with the following layer declaration. You can also use the :enabled-for construct to disable it for all layers except those explicitly identified. Note that :enabled-for may be an empty list. :enabled-for takes precedence over :disabled-for if both are present. By default a declared layer installs/configures all its associated packages. You may want to select only some of them or ignoring some of them. This is possible with the :packages keyword. Note: Ignoring a package from a layer is different than excluding a package. An excluded packages is completely removed from your configuration whereas an ignored package is ignored only for a given layer but it can remain on your system. It happens that if the given layer is the owner of the package then ignoring this package is the same as excluding it (because the package becomes orphan so it is considered unused by Spacemacs). You can exclude packages you don't want to install with the variable dotspacemacs-excluded-packages (see Configuration layers for more info on packages). When you exclude a package, Spacemacs will automatically delete it for you the next time you launch Emacs or at the next dotfile synchronization. All the orphan dependencies are also deleted automatically. Excluding a package effectively remove all references to it in Spacemacs without breaking the rest of the configuration, this is a powerful feature which allows you to quickly remove any feature from Spacemacs. Note: A few packages are essential for Spacemacs to correctly operate, those packages are protected and cannot be excluded or unsintalled even if they become orphans or are excluded. use-package is an example of a protected package that cannot be removed from Spacemacs. 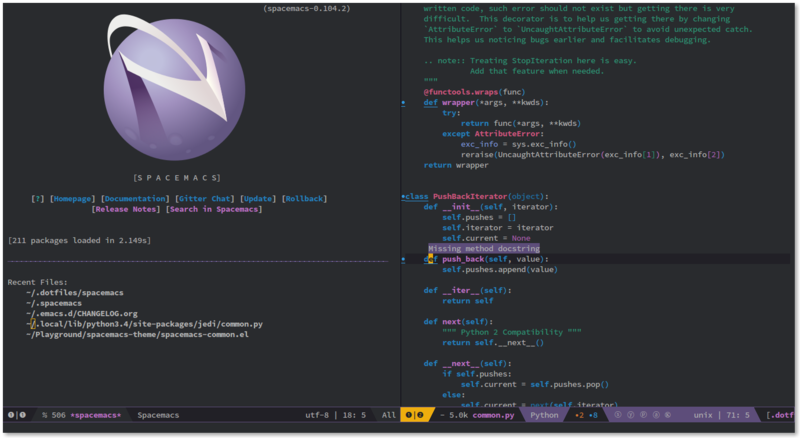 Spacemacs comes with several editing styles which can be switched dynamically providing an easier way to do pair programming, for instance between a Vim user and an Emacs user. Hybrid (a mix between Vim and Emacs). Spacemacs behaves like in Vim using Evil mode package to emulate Vim key bindings. This is the default style of Spacemacs; it can be set explicitly by setting the dotspacemacs-editing-style variable to vim in the dotfile. Spacemacs behaves like in raw Emacs using the Holy mode which configures Evil to make the emacs state the default state everywhere. Set the dotspacemacs-editing-style variable to emacs in the dotfile. In Emacs style the leader is available on M-m. It is possible to toggle it on and off with SPC t E e and M-m t E e. When off the vim style is enabled. The hybrid editing style is like the Vim style except that insert state is replaced by a new state called hybrid state. In hybrid state all the Emacs key bindings are available; this is like replacing the insert state with the emacs state but provides an isolated key map evil-hybrid-state-map. hybrid-mode-default-state The default state when opening a new buffer, default is normal. Set it to emacs for a more emacsy style. hybrid-mode-enable-hjkl-bindings If non nil then packages will configure h j k l key bindings for navigation. hybrid-mode-enable-evilified-state If non nil buffer are evilified when supported, if nil then emacs state is enabled in those buffers instead. To toggle the hybrid style on and off use SPC t E h and M-m t E h. When off the vim style is enabled. evilified light brown exclusive to Spacemacs, this is an emacs state modified to bring Vim navigation, selection and search. Note: Technically speaking there is also the operator evil state. Some buffers are not for editing text and provide their own keybindings for certain operations. These often conflict with Vim bindings. To make such buffers behave more like Vim in a consistent manner, they use a special state called evilified state. In evilified state, a handful of keys work as in Evil, namely /, :, h, j, k, l, n, N, v, V, gg, G, C-f, C-b, C-d, C-e, C-u, C-y and C-z. All other keys work as intended by the underlying mode. For example, if the mode binds a function to n, that is found under C-n in evilified state, since both n and N are reserved, but C-n is not. On the other hand, anything originally bound to k will be found on K, since k is reserved but K is not. If there is a binding on K, that will be moved to C-k. In addition to this, C-g, being an important escape key in Emacs, is skipped. So anything bound to g originally will be found on C-G, since g, G and C-g are all reserved. Spacemacs uses a leader key to bind almost all its key bindings. This leader key is commonly set to ​,​ by Vim users, in Spacemacs the leader key is set on SPC (the space bar, hence the name spacemacs). This key is the most accessible key on a keyboard and it is pressed with the thumb which is a good choice to lower the risk of RSI. It can be customized to any other key using the variable dotspacemacs-leader-key and dotspacemacs-emacs-leader-key. The universal argument C-u is an important command in Emacs but it is also a very handy Vim key binding to scroll up. Spacemacs binds C-u to scroll-up and change the universal argument binding to SPC u.
Spacemacs defines a wide variety of transient states (temporary overlay maps) where it makes sense. This prevents one from doing repetitive and tedious presses on the SPC key. When a transient state is active, a documentation is displayed in the minibuffer. Additional information may as well be displayed in the minibuffer. The ​,​ key does "repeat last f, t, F, or T command in opposite direction in Vim, but in Spacemacs it is the major mode specific leader key by default (which can be set on another key binding in the dotfile). Send a PR to add the differences you found in this section. There is one obvious visible difference though. It is not between Evil and Vim but between Spacemacs and vim-surround: in visual mode the surround command is on S in vim-surround whereas it is on s in Spacemacs. surround command is just a more powerful command than s.
The kbd macro accepts a string describing a key sequence. The global-map is often shadowed by other maps. For example, evil-mode defines keymaps that target states (or modes in vim terminology). Here is an example that creates the same binding as above but only in insert state (define-key is a built-in function. Evil-mode has its own functions for defining keys). These functions use a macro like kbd to translate the key sequences for you. The second function, spacemacs/set-leader-keys-for-major-mode, binds the key only in the specified mode. The second key binding is active only when the major mode is emacs-lisp. Finally, one should be aware of prefix keys. Essentially, all keymaps can be nested. Nested keymaps are used extensively in spacemacs, and in vanilla Emacs for that matter. For example, SPC a points to key bindings for "applications", like SPC a c for calc-dispatch. Nesting bindings is easy. The first line declares SPC ] to be a prefix and the second binds the key sequence SPC ]] to the corresponding command. The first line is actually unnecessary to create the prefix, but it will give your new prefix a name that key-discovery tools can use (e.g., which-key). There is much more to say about bindings keys, but these are the basics. Keys can be bound in your ~/.spacemacs file or in individual layers. SPC T n switch to next theme listed in dotspacemacs-themes. SPC T s select a theme using a helm buffer. You can see samples of all included themes in this theme gallery from Rob Merrell. You don't need to explicitly list in a layer the theme packages you are defining in dotspacemacs-themes, Spacemacs is smart enough to remove those packages from the list of orphans. Due to the inner working of themes in Emacs, switching theme during the same session may have some weird side effects. Although these side effects should be pretty rare. In the terminal version of Emacs, color themes will not render correctly as colors are rendered by the terminal and not by emacs. You will probably have to change your terminal color palette. More explanations can be found on emacs-color-theme-solarized webpage. The default font used by Spacemacs is Source Code Pro by Adobe. It is recommended to install it on your system if you wish to use it. (setq-default dotspacemacs-default-font '("Source Code Pro"
If the specified font is not found, the fallback one will be used (depends on your system). Also note that changing this value has no effect if you are running Emacs in terminal. :family Font family or fontset (a string). :height The height of the font. In the simplest case, this is an integer in units of 1/10 point. :size The font size- either a non-negative integer that specifies the pixel size, or a floating-point number that specifies the point size. :adstyle Additional typographic style information for the font, such as 'sans'. The value should be a string or a symbol. :registry The charset registry and encoding of the font, such as 'iso8859-1'. The value should be a string or a symbol. :script The script that the font must support (a symbol). The special property :powerline-scale is Spacemacs specific and it is for quick tweaking of the mode-line height in order to avoid crappy rendering of the separators like on the following screenshot (default value is 1.1). Note: These toggles are all available via the helm-spacemacs-help interface (press SPC h SPC to display the helm-spacemacs-help buffer). Line numbers can be toggled on in all prog-mode and text-mode buffers by setting the dotspacemacs-line-numbers variable in your ~/.spacemacs to something different than nil. Users who run Emacs in terminal mode may need to install the Powerline patched fonts and configure their terminal clients to use them to make the Powerline separators render correctly. When Flycheck minor mode is enabled, a new element appears showing the number of errors, warnings and info. Anzu shows the number of occurrence when performing a search. Spacemacs integrates nicely the Anzu status by displaying it temporarily when n or N are being pressed. See the 5/6 segment on the screenshot below. fancy-battery displays the percentage of total charge of the battery as well as the time remaining to charge or discharge completely the battery. Note the these colors may vary depending on your theme. "This is were you can ultimately override default Spacemacs configuration. This function is called at the very end of Spacemacs initialization." Unicode symbols are displayed by default. Setting the variable dotspacemacs-mode-line-unicode-symbols to nil in your ~/.spacemacs will display ASCII characters instead (may be useful in terminal if you cannot set an appropriate font). The letters displayed in the mode-line correspond to the key bindings used to toggle them. Some toggle have two flavors: local and global. The global version of the toggle can be reached using the control key. Spacemacs uses Spaceline to provide its mode-line. It consists of a number of segments arranged on the left and right sides. These are defined in the variables spaceline-left and spaceline-right. Segments can be defined using spaceline-define-segment, and added to the appropriate location in the left or right hand side variables. Please see the Spaceline documentation for more information. Layouts are window configurations with buffer isolation, each layout can define several workspaces (think of them as sub-layouts) sharing the same list of buffers as their parent layout. A layout is a window configuration associated with a list of buffers. The list of buffers can be an arbitrarily chosen set of buffers. Spacemacs provides some facilities to create meaningful sets of buffers, for instance the buffers related to a projectile project. The name of the current layout appears in the mode-line at the far left (first element of the mode-line). To create a new layout type a layout number that does not exist yet. For instance if you have two layouts currently then type SPC l 3 to create a third layout. The default layout (the layout created at the startup of Emacs) is not displayed in the mode-line but it is possible to display it by setting the variable dotspacemacs-display-default-layout to t.
Its name is "default" by default but it can be changed by setting the variable dotspacemacs-default-layout-name. The default layout is special because it has a global scope which means that all the opened buffers belong to it. So using only the default layout feels like not using layouts at all. A project layout is bound to a projectile project. To create a project layout use SPC p l.
The name of the layout is the name of the project root directory. Custom layouts can be defined using the macro spacemacs|define-custom-layout, they are accessible via SPC l o. By convention the name of a custom layout should start with @. Then use SPC l o E to start ERC inside its own layout. Any new ERC buffer will be part of the custom layout. With SPC l s and SPC l L you can save and load layouts to/from a file. Note: By default, Spacemacs will automatically save the layouts under the name persp-auto-save. Setting the variable dotspacemacs-auto-resume-layouts to t will automatically resume the last saved layouts. The key bindings are registered in a transient state. The docstring of the transient state displays the existing layouts and the currently active layout has square brackets. Pressing a layout number will activate it (or create a new one) and exit the transient state. It is possible to just preview a layout with Ctrl-<number>. Pressing TAB will activate the previously selected layout. Press ? to toggle the full help. Workspaces are sub-layouts, they allow to define multiple layouts into a given layout, those layouts share the same buffer as the parent layout. The currently active workspace number is displayed before the window number, for instance "➊|➍" or "1|4" means the fourth window of the first workspace. Any new layout comes with a default workspace which is the workspace 1. Switching to a workspace that does not exist in the current layout will create a new one. For instance at startup you can press SPC l w 2 to create the workspace 2 in the default layout. When created a workspace is anonymous, you can give them a name with SPC l w R.
The key bindings are registered in a transient state. The docstring of the transient state displays the existing workspaces and the currently active workspace has square brackets. Pressing a workspace number will activate it (or create a new one) and exit the transient state. It is possible to just preview a workspace with Ctrl-<number>. Pressing TAB will activate the previously selected workspace. Spacemacs is based on Vim modal user interface to navigate and edit text. If you are not familiar with the Vim way of editing text you can try the evil-tutor lessons by pressing SPC h T at any time. Spacemacs uses evil-escape to easily switch between insert state and normal state by quickly pressing the fd keys. If you find yourself in a buffer where the Spacemacs (SPC) or Vim keybindings don't work you can use this to get back to normal state (for example in SPC SPC customize press fd to make SPC b b work again). Note: Although jj or jk are popular choices of vim users, these key sequences are not optimal for Spacemacs. Indeed it is very easy in visual state to press quickly jj and inadvertently escape to normal state. The emacs command key SPC (executed after the leader key) can be changed with the variable dotspacemacs-emacs-command-key of your ~/.spacemacs. On top of Vim modes (modes are called states in Spacemacs) there is a special key called the leader key which once pressed gives a whole new keyboard layer. The leader key is by default SPC (space). It is possible to change this key with the variable dotspacemacs-leader-key. SPC o and SPC m o are reserved for the user. Setting key bindings behind these is guaranteed to never conflict with Spacemacs default key bindings. Example: Put (spacemacs/set-leader-keys "oc" 'org-capture) inside dotspacemacs/user-config in your ~/.spacemacs file, to be able to use SPC o c to run org mode capture. Mastering your choice of completion system will make you a Spacemacs power user. Do not hesitate to read the Helm documentation wiki. The command bound to C-z is much more useful than the one bound to Tab, so it makes sense to swap them. It's also recommended here. If you find yourself unable to return focus to Helm (after a careless mouse-click for example), use SPC w b to return focus to the minibuffer. Spacemacs defines a transient state for Helm to make it work like Vim's Unite plugin. Initiate the transient state with M-SPC or s-M-SPC while in a Helm buffer. A help buffer is displayed each time the SPC key is pressed in normal mode. It lists the available key bindings and their associated commands. By default the which-key buffer will be displayed quickly after the key has been pressed. You can change the delay by setting the variable dotspacemacs-which-key-delay to your liking (the value is in second). It is possible to search for specific key bindings by pressing SPC ?. To narrow the list to some key bindings using the leader key type a pattern like this regular expression: SPC\ b which would list all buffer related bindings. All layers can be easily discovered via helm-spacemacs-help accessible with SPC h SPC. helm-spacemacs-help also lists all the packages available in Spacemacs. The entry format is (layer) packages. If you type flycheck you'll be able to see all the layers where flycheck is used. package-list-packages is where you can browse for all available packages in the different Elpa repositories. It is possible to upgrade packages from there but it is not recommended, use the [Update Packages] link on the Spacemacs startup page instead. Spacemacs uses Paradox instead of package-list-packages to list available ELPA packages. Paradox enhances the package list buffer with better feedbacks, new filters and Github information like the number of stars. Optionally you can also star packages directly in the buffer. Important Note 1: Installing a new package from Paradox won't make it persistent. To install a package persistently you have to add it explicitly to a configuration layer. Important Note 2: Don't update your packages from Paradox or package-list-packages because they don't support the rollback feature of Spacemacs. helm-spacemacs-help is also a central place to discover the available toggles. To display only the toggles source press C-l (or in Helm transient state you can press just l). Tips Use SPC h l to resume the last helm session. It is handy to quickly toggle on and off a toggle. Navigation is performed using the Vi key bindings hjkl. smooth-scrolling prevent the point to jump when it reaches the top or bottom of the screen. It is enabled by default. You can also toggle smooth scrolling with SPC t v.
Spacemacs uses the evil integration of avy which enables the invocation of avy during motions. For instance, it is useful for deleting a set of visual lines from the current line. Try the following sequence in a buffer containing some text: d SPC j l, followed by selecting an avy candidate. Similar to avy, ace-link allows one to jump to any link in help-mode and info-mode with two key strokes. Spacemacs comes with a built-in port of tpope's vim-unimpaired. This plugin provides several pairs of bracket maps using [ to denote previous, and ] as next. The SPC j prefix is for jumping, joining and splitting. Every window has a number displayed at the start of the mode-line and can be quickly accessed using SPC number. A convenient window manipulation transient state allows performing most of the actions listed above. The transient state allows additional actions as well like window resizing. If you resize windows like crazy you may want to give a try to golden-ratio. golden-ratio resizes windows dynamically depending on whether they are selected or not. By default golden-ratio is off. The mode can be toggled on and off with SPC t g.
By default Spacemacs uses helm to open files. A convenient buffer manipulation transient state allows to quickly cycles through the opened buffer and kill them. Unlike vim, emacs creates many buffers that most people do not need to see. Some examples are *Messages* and *Compile-Log*. Spacemacs tries to automatically ignore buffers that are not useful. However, you may want to change the way Spacemacs marks buffers as useful. For instructions, see the special buffer howto. Convenient key bindings are located under the prefix SPC f e to quickly navigate between Emacs and Spacemacs specific files. In vim and hybrid styles, Spacemacs remap the navigation in Helm find-files to keep finger on the home row. Spacemacs displays the ido minibuffer vertically thanks to the ido-vertical-mode. Spacemacs defines a transient state for ido. Initiate the transient state with M-SPC or s-M-SPC while in an ido buffer. Spacemacs provides a quick and simple way to navigate in an unknown project file tree with NeoTree. To toggle the NeoTree buffer press SPC f t or SPC p t (the latter open NeoTree with the root set to the projectile project root). The NeoTree window always has the number 0 so it does not shift the current number of the other windows. To select the NeoTree window you then use SPC 0. Note: Point is automatically set to the first letter of a node for a smoother experience. face Show information by changing the color of the file/directory name. char Show information with a character to the left of the file/directory name. The default is nil (do not show source control information), which is recommended. Note: At this time, it is not recommended to set this to anything other than nil. Otherwise, it will become very slow with larger source trees. See https://github.com/jaypei/emacs-neotree/issues/126 for more information. classic Use an icon to display items - only suitable for gui mode. ascii The simplest style, it will use x, - to display fold status. arrow Use unicode arrows to display fold status. nerd Use the NERDTree indentation mode and arrows. Bookmarks can be set anywhere in a file. Bookmarks are persistent. They are very useful to jump to/open a known project. Spacemacs uses helm-bookmarks to manage them. To save a new bookmark, just type the name of the bookmark and press RET. doc-view-mode is a built-in major mode to view DVI, PostScript (PS), PDF, OpenDocument, and Microsoft Office documents. By default auto-saving of files is performed every 300 characters and every 30 seconds of idle time which can be changed by setting to a new value the variables auto-save-inteval and auto-save-timeout respectively. Auto-save of modified files can be performed in-place on the original file itself or in the cache directory (in this case the original file will remain unsaved). By default Spacemacs auto-save the file in the cache directory. To modify the location set the variable dotspacemacs-auto-save-file-location to original or cache. Local files are auto-saved in a sub-directory called site in the cache directory whereas remote files (i.e. files edited over TRAMP) are auto-saved in a sub-directory called dist. To disable auto-saving set the variable dotspacemacs-auto-save-file-location to nil. You can toggle auto-save in a buffer by calling the command auto-save-mode. The search commands in Spacemacs are organized under the SPC s prefix with the next key is the tool to use and the last key is the scope. For instance SPC s a b will search in all opened buffers using ag. If the last key (determining the scope) is uppercase then the current region or symbol under point is used as default input for the search. For instance SPC s a B will search with symbol under point (if there is no active region). If the tool key is omitted then a default tool will be automatically selected for the search. This tool corresponds to the first tool found on the system of the list dotspacemacs-search-tools, the default order is ag, pt, ack then grep. For instance SPC s b will search in the opened buffers using pt if ag has not been found on the system. It is possible to search in the current file by double tapping the second key of the sequence, for instance SPC s a a will search in the current file with ag. ag and pt are optimized to be used in a source control repository but they can be used in an arbitrary directory as well. It is also possible to search in several directories at once by marking them in the helm buffer. Beware if you use pt, TCL parser tools also install a command line tool called pt. When results have been saved in a regular buffer with F3, that buffer supports browsing through the matches with Spacemacs’ next-error and previous-error bindings (SPC e n and SPC e p) as well as the error transient state (SPC e). Hint: It is also possible to search in a project without needing to open a file beforehand. To do so use SPC p p and then C-s on a given project to directly search into it like with SPC s p.
SPC s w g Get Google suggestions in emacs. Opens Google results in Browser. SPC s w w Get Wikipedia suggestions in emacs. Opens Wikipedia page in Browser. Spacemacs uses evil-search-highlight-persist to keep the searched expression highlighted until the next search. It is also possible to clear the highlighting by pressing SPC s c or executing the ex command :noh. Spacemacs supports highlighting of the current symbol on demand (provided by auto-highlight-symbol mode) and adds a transient state to easily navigate and rename this symbol. To initiate the highlighting of the current symbol under point press SPC s h.
*: appears if there is at least one occurrence which is not currently visible. With evil-visualstar you can search for the next occurrence of the current selection. It is pretty useful combined with the expand-region bindings. Note: If the current state is not the visual state then pressing * uses auto-highlight-symbol and its transient state. Use helm-semantic-or-imenu command from Helm to quickly navigate between the symbols in a buffer. This is very similar to moccur, it displays a helm buffer with all the occurrences of the word under point. You can then change the search query in real-time and navigate between them easily. You can even edit the occurrences directly in the helm buffer and apply the modifications to the buffer. The paste transient state can be enabled by settings the variable dotspacemacs-enable-paste-transient-state to t. By default it is disabled. When the transient state is enabled, pressing p again will replace the pasted text with the previous yanked (copied) text on the kill ring. For example if you copy foo and bar then press p the text bar will be pasted, pressing p again will replace bar with foo. By default any pasted text will be auto-indented. To paste text un-indented use the universal argument. It is possible to disable the auto-indentation for specific major-modes by adding a major-mode to the variable spacemacs-indent-sensitive-modes in your dotspacemacs/user-config function. SPC i u Search for Unicode characters and insert them into the active buffer. Smartparens comes with a strict mode which prevents deletion of parenthesis if the result is unbalanced. This mode can be frustrating for novices, this is why it is not enabled by default. It is possible to enable it easily for all programming modes with the variable dotspacemacs-smartparens-strict-mode of you ~/.spacemacs. Note that only the text of the current buffer is scaled, the other buffers, the mode-line and the minibuffer are not affected. To zoom the whole content of a frame use the zoom frame bindings (see next section). Spacemacs uses evil-numbers to easily increase or decrease numbers. Tips: you can increase or decrease a value by more that once by using a prefix argument (ie. 10 SPC n + will add 10 to the number under point). Spell checking is enabled by including the spell checking layer in your dotfile. Keybindings are listed in the layer documentation. Vi Visual modes are all supported by evil. Spacemacs adds another Visual mode via the expand-region mode. Spacemacs uses the powerful iedit mode through evil-iedit-state to quickly edit multiple occurrences of a symbol or selection. The color code for these states is red. evil-iedit-state has also a nice integration with expand-region for quick editing of the currently selected text by pressing e.
To sum-up, in iedit-insert state you have to press ESC twice to go back to the normal state. You can also at any time press C-g or fd to return to normal state. Note: evil commands which switch to insert state will switch in iedit-insert state. iedit state inherits from normal state, the following key bindings are specific to iedit state. # prefix all occurrences with an increasing number (SPC u to choose the starting number). Note: 0, $, A and I have the default Vim behavior when used outside of an occurrence. If you have ag, pt or ack installed, replacing an occurrence of text in several files can be performed via helm-ag. Note: In Spacemacs, helm-ag despite its name works with ack and pt as well (but not with grep). Comments are handled by evil-nerd-commenter, it's bound to the following keys. Spacemacs uses the packages pcre2el to manipulate regular expressions. It is useful when working with Emacs Lisp buffers since it allows to easily converts PCRE (Perl Compatible RegExp) to Emacs RegExp or rx. It can also be used to "explain" a PCRE RegExp around point in rx form. Deletion is configured to send deleted files to system trash. To disable the trash you can set the variable delete-by-moving-to-trash to nil in your ~/.spacemacs. Editing of lisp code is provided by evil-lisp-state. Commands will set the current state to lisp state where different commands combo can be repeated without pressing on SPC k.
When in lisp state the color of the mode-line changes to pink. Note: The lisp state commands are available in any modes! Try it out. These commands automatically switch to lisp state. Projects in Spacemacs are managed with projectile. In projectile projects are defined implicitly, for instance the root of a project is found when a .git repository or .projectile file is encountered in the file tree. Helm is used whenever it is possible. To search in a project see project searching. Note for Windows Users: To enable fast indexing the GNU find or Cygwin find must be in your PATH. Spacemacs uses Flycheck to gives error feedback on the fly. The checks are only performed at save time by default. The next/previous error bindings and the error transient state can be used to browse errors from flycheck as well as errors from compilation buffers, and indeed anything that supports Emacs’ next-error API. This includes for example search results that have been saved to a separate buffer. Spacemacs binds a few commands to support compiling a project. Key bindings specific to the current major mode start with SPC m. For convenience a shortcut key called the major mode leader key is set by default on ​,​ which saves one precious keystroke. Spacemacs starts a server at launch. This server is killed whenever you close your Emacs windows. You can open a file in Emacs from the terminal using emacsclient. Use emacsclient -c to open the file in Emacs GUI. Use emacsclient -t to open the file in Emacs within the terminal. Tip: Remember to use :wq or C-x # after you are done editing the file in Emacs. See Emacs as a Server in the official Emacs manual for more details. It is possible to keep the server alive when you close Emacs by setting the variable dotspacemacs-persistent-server to t in your ~./spacemacs. SPC q Q Quit Emacs and kill the server, lose all unsaved changes. If any errors happen during the loading the mode-line will turn red and the errors should appear inline in the startup buffer. Spacemacs should still be usable; if it is not then restart Emacs with emacs --debug-init and open a Github issue with the backtrace. To ensure that packages are correctly compiled for the new Emacs version you installed, be sure to run the interactive command spacemacs/recompile-elpa with SPC SPC spacemacs/recompile-elpa. Thank you Richard for this great piece of software. Thank you to all the contributors and the whole Emacs community from core developers to elisp hackers!